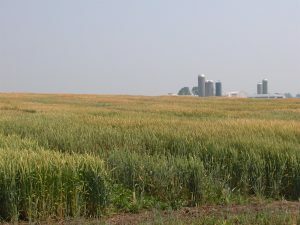 This will likely be the last winter wheat disease update for 2016, as the University of Wisconsin Field Crops Pathology team has nearly finished winter wheat disease ratings for 2016. In our travels this season we have determined that the major disease of concern was stripe rust. We were able to find stripe rust in every field we visited this season. In the variety trials throughout the state, stripe rust hit some varieties very hard, causing significant damage and early defoliation. Other varieties did fair well, so genetic resistance was obviously a big player for us this season. In production fields that did not receive an application of fungicide, stripe rust was often moderate to severe. Fields with resistant varieties and/or that received a well-timed fungicide had low levels of stripe rust and will yield well. Unlike 2015, Fusarium head blight (FHB or scab) has been relatively minimal. In the southern and eastern wheat production areas of the state we could find some low levels of FHB, however, severity is fairly minimal. This is likely due to the fact that the weather was very hot and mostly dry during the anthesis period in this part of the state. Further to the north and closer to Lake Michigan, we have found higher levels of FHB. In a production field near Marshfield, in central Wisconsin, FHB levels were significantly higher than observed in other parts of the state. Incidence was around 25-30% with severity averaging 15-20%. These higher levels of FHB likely resulted from more favorable weather for the FHB fungus during anthesis in this part of the state. For more information about how to handle FHB as we approach harvest CLICK HERE. Septoria leaf blotch was present in low levels in some fields. However it won’t be a substantial yield-reducer in 2016. Powdery mildew was nearly non-existent in the state for the fourth season straight. Next post: What is happening in the corn plant during the month of July?